Formula One is to ban the driver-aid traction control from next season. The sport's governing body the FIA will police the ban on the system that prevents wheelspin by forcing teams to use standard electronic control units. Traction control was first banned in 1994 to prevent the technology reducing the importance of driver skill. 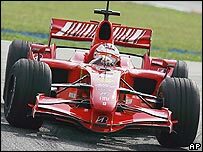 But it was allowed again in 2001 following fears that the FIA was unable to police the ban and that some teams had found ways to cheat. The use of standard electronics means the FIA should no longer have any concerns about teams being able to hide such driver-aid systems. The governing body has banned the system with a new clause added to revised technical regulations that were published on Friday. It said: "No car may be equipped with a system or device which is capable of preventing the driven wheels from spinning under power or of compensating for excessive throttle demand by the driver. "Any device or system which notifies the driver of the onset of wheel spin is not permitted."